Today is the Super Bowl. All week long I’ve posted food and beverage ideas here. This is the last shot before the game, a punch of Cointreau, cranberry juice and sparkling rosé. This is literally a sparkling beverage, one to keep you bright and perky through what, we all hope, is an exciting game. The recipe here is for one cocktail. It can be easily scaled up, or, just pour the bottles into your punch bowl [keeping a little back in reserve], then adjust with more juice or liqueur or wine or all three. 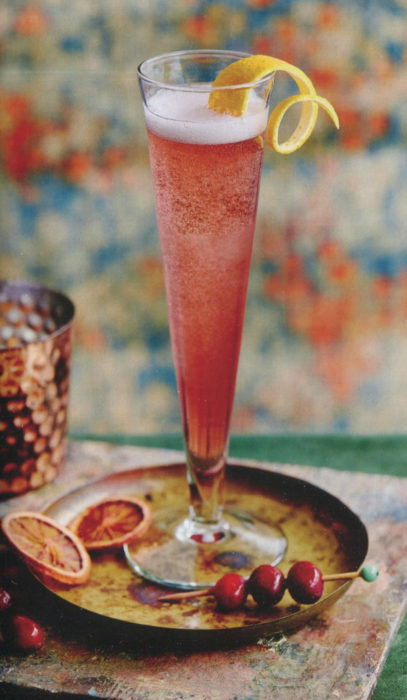 This recipe comes from Rosé Cocktails, a truly sparkling book. The book was published last year and is filled with ideas for rosé that will last you for the entire year. Pour the Cointreau and cranberry juice into a Champagne flute and top up with cold sparkling rose. Garnish with a twist of orange zest and/or a few fresh cranberries on a cocktail stick. Serve at once. Google, Facebook, Johnson & Johnson, Pfizer, JP Morgan Chase, Stanley, Ogilvy, American Express, Avon, ADP, Nike, Big Brothers, Big Sisters of NYC Columbia, Cisco, Coach, Deloitte, Colgate, Coty, Deutsche Bank, RBC, Dunn & Bradstreet, E & Y, General Electric, Yelp, NBC, Universal, Univision.